Challenge: Then Why Is there Evil? See you back here with Brett on Thursday! if there is EVIL then its a departure of good – so evil actually proves gods existence cause we live in a world where there are Universal Absoutles – Evil is not the way things -ought- to be so evil proves god’s existence – the atheist that raises this objection to god actually backfires – its funny when the atheist crittizez the believer for believing something thats immaterial (God), but when the atheist uses Evil (which is also immaterial) as an attack against god why buy into it – in other words i should ask the atheist “why should i belive in such absured and abstract enities like good and evil “? For this argument, the atheist doesn’t need to assume that objective good and evil exist, they are just trying to show an internal incoherence in the Christian worldview itself. So, while your argument makes a good point, I wouldn’t go that direction myself. This is the logical problem of evil, which tries to show that there’s an inconsistency between the Christian idea of God (all good, all powerful, all knowing) and the existence of evil. All we have to do is show that it’s POSSIBLE for such a being to exist even if evil exists, and we’ve shown that the contradiction doesn’t work. Using Plantinga’s free-will defense, God gave creatures free-will so they can exercise good, but freedom means they can potentially do evil. Sure, God could MAKE them always chose good, but then we wouldn’t be free. Despite the fact that we think God is omnipotent, that doesn’t mean He can do logically incoherent things, like create a square circle. It’s not possible to MAKE people FREELY do good. God may know about evil, have the power to stop it, and be good, but He may let it exist for some morally sufficient reason. Some overwhelmingly good states of affairs may only happen if an evil state of affairs happens, and for God to prevent the evil state of affairs would also prevent the overwhelming good state of affairs from happening. I actually wrote a three part blog series on this for my college ministry at MU. Here it is. The error is in the red “No” arrow from the bottom left “Could God have created a universe with free-will but without evil?” up to “Then God is not all powerful.” It’s the same error as saying, “Well, if God can’t create a rock so large that even he can’t move it, then I guess he’s not all powerful then is he?” There are certain logical limits to God’s power. He can no more create free-will without evil than he could create a rock he can’t move – both statements are illogical. I Love this! I think it’s great that us possibly being the problem is not mentioned on the diagram. Theologically evil comes from man Romans 8:19-22, ones responses might be that evil existed before man. I agree will William Dembski’s Theodocy which points out that God opperates with purpose and could have allowed the implications of sin prior to sin. Just as he purposed the solution to sin prior to sin Revelation 13:8. God allows evil as a reminder of our Great need for him. In other words the good that will come from our evil out weighs the evil of our evil. Sometimes we get so caught up in time we miss purpose. Kyle and Ian, will we be free in heaven and in the new earth? You know, I’ve actually been wondering about that. If sin comes from free will, and Matt 13:41 says the causes of sin will weeded out from the Kingdom, then does that mean there is no free will in the Kingdom? Anywho, don’t have much to contribute here. But I would like to ask what kind of evil they are talking about, because different kinds merit different kinds of responses. Not too different, but still different. So are they talking about evil humans cause, or perhaps natural evil? Assuming man made evil, I will progress in this way. Can God prevent evil? Not if the decision was freely made. As many have already pointed out, its a logical contradiction to say that God made someone freely do something. So while God might not be able to do this, this doesnt mean he not all powerful. God does know about evil, so no contention there. God does want to do something about evil? Maybe not, but if he didn’t, that wouldn’t mean he isn’t loving. If God created a world in which no one sinned, yet due to will, this number was small, it may not be as desirable as a world where more people sin and thus not get saved yet more people do get saved. So he may not want a world where there is less evil because that will result in more people ultimately saved. The unsaved don’t get “veto power” because they cause more evil. As many people have said, there may be a morally sufficient reason for allowing this to happen. Why satan? For similar, if not the exact same reasons as mentioned above. and the rest is pretty much the same. Adrian, you said, “Can God prevent evil? Not if the decision was freely made.” But I actually think God is preventing evil all the time (as He did in Genesis 20:6). If He didn’t restrain our evil, things would be far worse. But I think our sinlessness in heaven argues strongly for a compatibilist view of freedom. We’ll be changed so that we only desire to do good, after which we will freely choose to do good. But for now, we make choices out of our corrupted nature, and so we choose to sin. That’s actually what I wanted to ask myself, cause I’m not sure I fall into the libertarian camp. I’d lean more towards your compatibilisf view of us in Heaven, Amy, and wonder how assuming a compatibilist view of free will affects the argument. Well, I do have some thoughts about how to answer this objection that reflect my compatibilist view, and I’ll post them tomorrow. It does affect how the question is answered because if God could have ensured that our natures remained good (so that we would freely choose out of our natures to do good just as God chooses only to do good out of His good nature), why didn’t He? I just don’t see how the free will defense can get around the fact that we won’t sin in heaven. Amy, it seems at least possible to me for us to be sinless in heaven even if we are free in the libertarian sense. According to Molinism, God knows all the counterfactuals of human freedom. Craig often says that God actualized the world that resulted in the greatest number of people saved. But perhaps there were other factors involved besides that. Maybe God actualized a world in which those who go to heaven never sin once they get there. It’s not that they couldn’t sin; it’s just that they won’t. I think the free will defense works even though I don’t personally subscribe to libertarian freedom. I’m not a fan of the freewill defense since free will is un-biblical. The flaw is in number 3. God does create evil “I form the light, and create darkness: I make peace, and create evil: I the LORD do all these things.”(Isaiah 45:7) However, just because He creates evil, it doesn’t mean He Himself is evil or not good/loving. For them to say that God isn’t good/loving for creating evil, they would have to put their morality above God’s and judge God based on their morality which has no objective basis. Either that or they would have to show how God creating evil is contradictory towards His own nature as described in the Bible. And since there’s nothing in the Bible that says it’s wrong for God to create evil, and there’s quite a few verses that talks about Him doing such, there is no problem of Evil. It’s ironic isn’t….here we have “Atheistic logic” trying to discredit God’s existence with an assumed understanding of God’s character…i.e,.”if God were this, then He would be that”. They (Atheist) “dis” our arguments for God, as illogical and unscientific, and in the same breath rail against Him… because He will not conform to their non-logical idea of creating man with absolute freewill (including the freedom to choose to do evil). While somehow not allowing that choice to actually exist. It is logically impossible for the two concepts to co-exist. Either A or B…the principle of the excluded middle. I think first and foremost, we need to address the purpose of evil in the world. 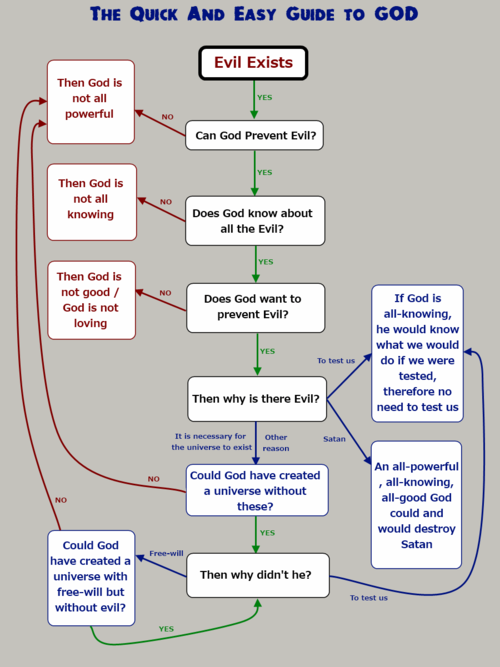 With the first two questions in the original diagram, I agree that God both can prevent evil and that He also knows about all evil. The third question– “Does God want to prevent evil?”– (along with the following connotations afterwards) is the one which originally drew the red flag for me. What do you mean when you say God wants to prevent evil? At what cost? And for what ultimate purpose? There is no explicit contradiction between God and evil, though (as many Atheists would argue) there may be an implicit one. No Atheist has ever been able to sustain the burden of proof for this as far as I am concerned. In fact, we can also show that God is perfectly compatible with evil by adding another proposition: that God has morally sufficient reasons for allowing evil. If God has morally sufficient reasons for allowing evil in the world, then we should expect the presence of evil in the world to be present for an ultimate good! But what is that good/purpose? Well, to start, it is not by any means to pamper human beings– a proposition many people often erroneously assume. I think that God has an ultimate purpose of drawing us into a loving relationship with Himself, and, at times, He uses the things that will cause us the deepest pain to bring us to the realization of the ultimate good– which is Him. He wants us to see Him as He truly is– supremely valuable. He wants us to love, worship, and cherish Him. With this in mind, it is not at all liberal or extreme to say that God should not prevent all evil. Of course He despises it. It even grieves Him. But in any case, He will allow anything– even evil– to bring us to that which is to be valued above all. And of course I say this with the realization that God is not directly causing the evil, but rather is allowing it as it is a consequence of sin that has already taken place. That’s a very sly diagram, but it simply assumes too much. I agree with Ian, you can’t have free will without a choice. God is all powerful but He can’t create a round square nor another all powerful god. The whole map is flawed. God is the first cause of all things and everything that comes to pass. As creatures we are the secondary cause of things by fact that we are the ones who carry it all out. However, we as creatures carry out evil actions for the purpose of doing bad and carrying out our own fallen choices. God however uses our evil actions to carry out His good and perfect plan. Two unique purposes being done through one action. One for good the other for evil. This can best be seen in the story of Joseph where we read in Genesis 50:20 that what they did for evil God meant it for good so that many people would be saved alive. The chart is too simplistic and does not explore all the options. It (as well as most Christians) never consider the idea that God ordains that evil come to pass so that He can glorify Himself as the Triune God by saving sinners who commit evil actions of their own accord. Will STR be posting a response to this challenge here? I am interested to see how it is handled. Usually, the responses are posted on Thursdays. Yeah, Brett will post a response tomorrow, but it won’t be in this comment section. It will be a video in a new post. A great topic going here. The comment by Charles got me thinking. Why couldn’t God create another God? Obviously the Created God would be created and would not have always existed, but what other shortcomings would Created-God have? Maybe asked another way, what is the most God-like person that God could create? I know several people who are ex-drug addicts, criminals, prostitutes etc who say they never would have found Christ if they hadn’t have hit rock bottom, even evil has it’s purpose in Gods plans. Read Ecclesiastes. Airpierre, you mean like Satan? Here are some of my thoughts on this: The creator of this flowchart hasn’t even considered a third option that I think is the answer. In answer to the question, “Then why didn’t He?” he offers two solutions: to test us, or to allow free will. I don’t think we can make free will the answer because God clearly can have human beings that don’t sin and yet aren’t robots. That place will exist in the new earth. So I don’t think we can say that God had to leave us free to sin in order to give us real choices. We won’t sin in heaven, so obviously we will be changed in a way that will ensure we won’t sin in the future. If He can do it in the future, He could have done it from the beginning. But there’s a third option that wasn’t considered in the chart (Elliot went in this direction, too): God allowed us to sin because His ultimate goal in creation is to reveal Himself fully to His creation so that His people can fully know Him and rightly glorify and enjoy Him forever. And the cross was the brilliant way God chose to reveal Himself. As Paul explains in Romans 3, it’s the cross that reveals both God’s righteousness/justice and His mercy/grace. Without sin in the world, we would never have seen or experienced God’s grace, nor would we have seen His justice. We could have enjoyed His goodness, but there would have been so much of God that we would have never known, and we would have been much poorer for all eternity for not knowing. The end result of a world with the cross is far, far greater than the result of a world where sin never occurred. So God decided not to prevent evil–not because He’s not loving (as the chart would indicate), but because His goal in loving His people was to create a world in which His excellent nature would be fully revealed to them and enjoyed by them forever. This also responds to the statement, “An all-powerful, all-knowing, all-good God could and would destroy Satan.” The creator of this flowchart is presuming to know what God would do without taking into account anything God actually said about His purposes and goals in the Bible. (I see this kind of presumption all the time.) There actually is a reason why God would not destroy Satan, and that reason is the cross. Before the foundation of the world it was God’s plan to reveal His grace, mercy, judgment, and righteousness on the cross. Amy, you say that God allowed us to sin because our sin ultimately results in God’s glory. But if God’s glory is the greatest good, and if revealing his glory was God’s greatest purpose, wouldn’t God want to make sure that people would sin rather than merely allowing it? What if God knew ahead of time that without his intervention, nobody would sin. Imagine if passively “allowing” wouldn’t actually result in human sin. Would God, then, be justified in causing people to sin? Since I think God is sovereign, I think it has to be more than “allowed.” Otherwise it makes no sense to say that God meant the actions of Joseph’s brothers for good. But on the other hand, to say God caused people to sin conjures up images in people’s minds of people being forced to sin against their will, and I think that communicates something false. When people sin, they’re doing what they truly will to do. So I don’t like to use that word. So I think that sin was part of God’s decree for history, as were particular sins (like the crucifixion of Christ), but that whatever that means, people are still acting according to their own will, for which they’re responsible. Sometime we’ll have to go into the question of why an act of sin by a human (like the crucifixion) is not a sin by God, though He decrees it. It sounds like you already answered that. In the case of Joseph’s brothers selling him into slavery, God meant it for good, but Joseph’s brothers meant it for evil. That’s why Joseph’s brothers sinned, but God didn’t. I wrote about it here and had a nice debate on it in the comment section. We had to have the ability to choose evil as well as good in order to have “true” freewill. While on this earth that choice is available. We freely choose “now” what our destiny shall be. God has promised that if we choose to do good, by being obedient creatures, then He will remove the desire (sin nature) for wrongdoing from us….once in heaven. At that time, we will have the nature of our Lord, Jesus. I fail to see how God could have handled it any other way so that the choice is genuinely ours. Our freedom of choice is still honored while in heaven….receiving the gift of salvation. The way I see it, our choice is not taken away….it’s supra-charged! Darrell, so are you saying we won’t have “‘true’ freewill” after the resurrection? If “‘true’ freewill” is so valuable, does that mean we will be something less in heaven than we are now? If, on the other hand, in the new earth we will actually be exactly as human beings were created to be, maybe it’s the case that we were always making choices out of our nature (our desires, inclinations, spiritual life/death). In heaven, our natures will no longer be prone to sin, so our choices will be for good. On earth, people’s natures begin as spiritually dead, and so they sin and reject God. Won’t our choices in heaven be as “genuinely ours” as our choices are now? Aren’t they now genuinely coming from us, out of who we are? We always have freedom of choice, but the problem is that what we freely choose depends on our current nature. And every human being who comes into the world has a spiritually dead nature that will never choose God. But just as God has freedom of choice and yet His decisions are always for good, so lost human beings have freedom of choice, but their decision is to rebel against God. If God were to truly “honor our free choice,” He would let us all continue to choose to rebel against Him and remain an “object of His wrath.” Thank God, He doesn’t do this! Instead He changes us so that we freely choose Him (no one can come to Jesus “unless it has been granted him from the Father” – John 6:65, and all that the Father gives Jesus will come to Him – John 6:37). This is why God gets all the glory for our salvation–He initiates it from start to finish, completely out of His grace and mercy. And we have absolutely nothing to boast about over those who did not choose God because our choice to love God was enabled by God, and did not come about because we were better/smarter/more spiritual people than those who remained in their sin. Can God prevent evil? : Yes. At the very least, he could’ve refrained from creating anything. Does God know about all the evil? : Yes. He’s all knowing. Does God want to prevent evil? : No. ==> God is not good/loving. That only follows if you assume God has no morally sufficient reason for allowing or causing evil. If God has a morally sufficient reason for allowing or causing evil, then God’s reluctance to prevent evil does not entail that God is not good or that he’s unloving. It would show just the opposite. So before our atheist’s argument can go through, he needs to rule out that possibility. Simply and truly put! And since they’re arguing only against an inconsistency in Christianity, all we need to offer is an explanation within Christianity in order to give a morally sufficient reason. They don’t have to believe the reason is true in order to refute the objection of inconsistency. The opposite of the register can be adressed in this argument as well. Do we assume that those that don’t choose God, and instead choose Hell, stop rebelling against God? For me C.S. Lewis put it best (if a bit dogmaticlly) in ‘The Great Divorce’. “There are two types of people. Those to whom say to God, “thy will be done”. And those to whom God says, “Thy will be done”. Do we assume that free will ends at death?